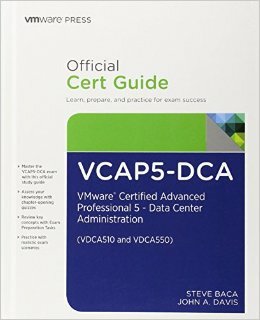 he VCAP5-DCA Official Cert Guide focuses specifically on the objectives for the VMware Certified Advanced Professional 5–Data Center Administration. VMware Certified Instructors (VCI) Steve Baca and John A. Davis share preparation hints and test-taking tips, helping you identify areas of weakness and improve both your conceptual knowledge and hands-on skills. Material is presented in a concise manner, focusing on increasing your understanding and retention of exam topics.